The hair-of-the-dog-that-bit-you is a time-honored allergy remedy for a good reason: It works. But how it works has not been well understood. Now a research team led by Duke Health, using mice as the models, has described the cellular processes that occur during “rush desensitization.” The approach involves giving a small dose of the allergy trigger — peanuts or bee poison or even chemotherapy — to the susceptible patient in small, yet increasing doses over a short period. Understanding how the process works could lead to new and better therapies for managing allergies to foods, dust, pollen, drugs and insect bites that cause serious and even fatal reactions for millions of people annually. Abraham and colleagues employed different experiments to track the cellular events during allergic reactions and after rush desensitization. The team included A. Wesley Burks, M.D., who, before he left Duke for the University of North Carolina at Chapel Hill, pioneered a peanut allergy approach for children that relied on rush desensitization principals. Allergy symptoms arise from a process that starts in the immune system’s mast cells, which are white blood cells that harbor tiny containers called granules filled chemicals involved in the inflammatory process such as histamines and heparins. When a person is exposed to an allergen such as pollen for the first time, the body makes an antibody known as immunoglobulin E, or IgE, which is capable of binding to the allergen whenever another exposure occurs. Once produced, these IgE antibodies collect in large numbers on the surface of mast cells. During subsequent exposures, the allergen is promptly recognized by IgE, which binds to it and immobilizes it on the mast cell. That process initiates a signal that triggers expulsion of the granules from the mast cell, releasing the inflammatory chemicals. The result is allergy symptoms such as sneezing, wheezing, itching and swelling. In severe cases, when mast cells lining blood vessels release their inflammatory contents throughout the body, the reaction can be life-threatening. 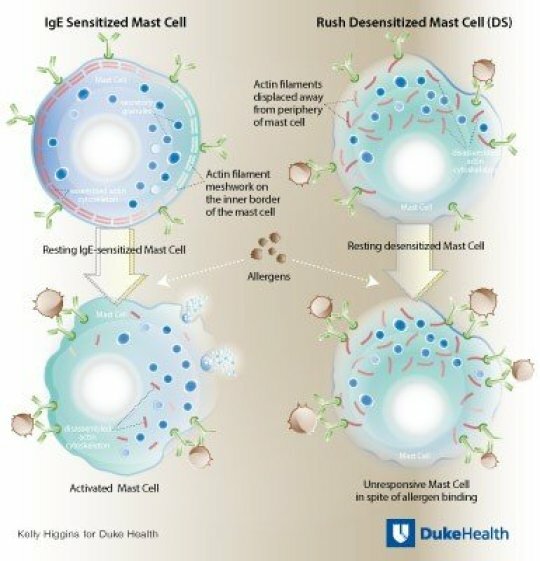 It’s long been understood that rush desensitization therapy somehow disrupts the mast cells through the repeated exposure of allergens over several hours or days. Abraham and colleagues found that the disruption occurs inside the mast cells, among tiny filaments called actin that line the inner envelop of the cell. When confronted with an allergen, the actin breaks down and rushes to the center of the cell, creating the conditions necessary for the eruption of the granules. When tiny doses of allergen are administered during rush desensitization, however, the actin are fooled into disassembling, and prematurely move to the center of the cell. The misplacement of the cellular actin, however, does not initiate expulsion of the granules and the inflammatory chemicals. Even with repeated and escalating exposures, the cascade of events is avoided and there is no allergic reaction.